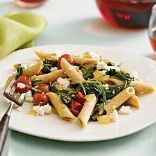 Make with basil, arugula, or parsley! Great on whole-wheat crackers or even toast. Squash Casserole with whole wheat crackers.